SolaWrap's Own Greenhouse Kit Designs- Built to LAST! Who Is The SolaWrap Greenhouse Intended For? Commercial growers who depend on the strength of the frame coupled with the superior covering SolaWrap. Commercial growers who don't have time to recover the greenhouse every 4 years or when the poly film fails. Commercial growers who can't afford a crop failure due to a breach in the film after a storm. 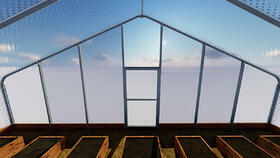 Home owners who want the Cadillac of greenhouse kits- A serious professional greenhouse. Commercial growers and homeowners alike who live in snowy, windy regions that need a very strong greenhouse covering and structure. These kits include everything needed to construct a greenhouse except baseboards, heating and cooling. PRICING: The price is based on your location. If you have high wind, snow, seismic or rain in your area, we will include more steel to protect against failure. While there are "kits"- they are made to order and thus the pricing varies due to your weather and location. WHY GET A SOLAWRAP GREENHOUSE KIT? What makes our kit hold up years after the others collapse under the snow/ wind load? 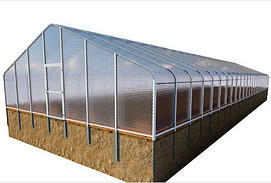 SolaWrap greenhouse kits are made with American made galvanized steel tubing. Purlins: All SolaWrap greenhouses have 5 purlins as well as collar ties and vertical bracing. What differentiates a SolaWrap Greenhouse? SolaWrap houses only have one connection pint. The bows are only 2 pieces with an 18" sleeve that connects the two bows. Doors: All kits have steel doors that can be customized when ordering. Discounted prices for multiple greenhouse purchases. For a Custom Greenhouse or a Crop Specific Custom SolaWrap Greenhouse learn more here! Do you have a quick question? Please submit it below.